Hi, I'm Mel, come on in. This is my place, Mel’s on Main, best café in Blue Plum, Tennessee. And I'm sorry, but we’ll have to work around the Caramelized Upside Down Pear Tart I’ve got going in one oven and the Rosemary Olive Oil cake in the other and the pizza dough rising in between the two. Before you know it, the mid-morning coffee crowd will be here, too. Did I tell you I’m short-handed? That's the story of my life some days. Pull up a chair, though, and hang on a mo. I’ll be back in three shakes. Okay, I'm back for now. Things are good in the kitchen. They smell good, too, don’t you think? Cinnamon, chocolate, coffee, yeast—you can’t go wrong with those aromas hanging in the air. So what do you want to ask me? Oh but wait, first let me tell you what most people ask me. You might think they’d wonder where I learned to cook, or where I get my recipes, or why I came back to Blue Plum after I left it in the dust all those years ago. Or they might ask if I ever think about expanding the business, or wonder if I get tired of the grind and getting up in the small hours and slaving over a hot stove. But they don’t ask those questions, not that I’d necessarily answer them anyway, but you know what they do ask? Two things: A, they ask why the spiked hair and, B, they ask why is it bright mustard yellow? Dang, and now there goes the timer. Sorry gotta run. Tell you what though, stick around and I’ll send out a slice of that Caramelized Upside Down Pear Tart and a cup of coffee along with the recipe. Doesn't that sound a whole lot better than an interview anyway? I mean, after all, do you like people hanging around your kitchen asking nosy questions? Peel, halve, and core pears. Heat butter in a 9- to 10-inch cast iron skillet over moderate heat until foam subsides. Stir in sugar (sugar will not be dissolved). Arrange pears, cut sides up, in skillet with wide parts at rim of skillet. Sprinkle with cinnamon and cook, undisturbed, until sugar turns a deep golden caramel. (This can take as little as 10 minutes or as much as 25, depending on pears, skillet, and stove.) Cool pears completely in skillet. Put oven rack in middle position and preheat oven to 425ºF. Roll out dough on lightly floured surface. Arrange dough over caramelized pears, tucking edge around pears inside rim of skillet. Bake tart until pastry is golden brown, 30 to 35 minutes. Cool on rack 5 minutes. Invert rimmed serving plate (slightly larger than skillet) over skillet. Using pot holders to hold skillet and plate tightly together, invert tart onto plate. Serve tart warm or at room temperature. Blend together flour, butter, shortening, and salt in bowl until most of mixture resembles coarse meal with some small (pea-size) butter lumps. Drizzle evenly with 2 tablespoons ice water and gently stir with fork until incorporated. Squeeze a small handful: If it doesn’t hold together, add more ice water, a tablespoon at a time, stirring until just incorporated, then test again. Turn out mixture onto a lightly floured surface and divide into 4 portions. With heel of your hand, smear each portion once or twice in a forward motion to help distribute fat. Gather dough together with scraper and press into a ball, then flatten into a 5-inch disk. Chill dough, wrapped tightly in plastic wrap, until firm, at least 1 hour. Vintage Cookbooks and Crafts blog. Interviewer: Will you at least answer one question? What is Mel short for? Edna, thank you for that! Spikes are the way to go and who doesn't like a cheerful head of mustard-colored hair? What is Mel short for? Melody. I thought about calling the cafe Main Street Melody's, but someone told me it sounded too much like a music store. Besides, no one calls me Melody. Ever. Mel, I think I could be your best friend. 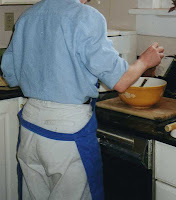 Please don't mention that to my BFF, Nina Reid Norwood -- I love her to death, but she doesn't cook. Blue Plum, huh? Must look at map. That tart is to die for! Oops, hope no one does! Sophie! Do you travel with an apron? Seriously, find a road map and come on down, or over, or whatever. If Nina finds out, take her a tart and she won't know what hit her. But only in a good way.